Orianthi Penny Panagaris (born 22 January 1985), known mononymously as Orianthi, is a Greek / Australian musician, singer and songwriter who rehearsed in 2009 with Michael Jackson in preparation for his ill-fated This Is It concert series, and performed with Alice Cooper's touring band. Her 2009 debut single "According to You" peaked at No. 3 in Japan, No. 8 in Australia and No. 17 in the US; her second album, Believe, received a worldwide release in late 2009. The same year, Orianthi was named one of the 12 Greatest Female Electric Guitarists by Elle magazine. She also won the award as "Breakthrough Guitarist of the Year" 2010 by Guitar International magazine. Orianthi Penny Panagaris was born in Adelaide, South Australia, and is of Greek descent. She began playing piano at the age of three and, at the encouragement of her father, moved to acoustic guitar at the age of six. When she was eleven, she took up electric guitar and left her school, Mercedes College, enrolling at Cabra Dominican College. She also attended St Peter's Collegiate Girls' School for a short period. At the age of 15, she turned her focus to writing songs and so began her professional career. She has been playing in bands since the age of 14 and performed in her first stage show for Steve Vai at the age of 15. Orianthi met and jammed with Carlos Santana when she was 18. He invited Orianthi to get up and jam with him at soundcheck then later asked if she would join him on stage that night to jam at his Adelaide concert, Memorial Drive on 30 March 2003. Orianthi independently released her debut studio album, Violet Journey in 2005, composing all the material, contributing guitar, vocals, and drums on most cuts. She produced and mixed the final product at her home studio. Carlos Santana brought Orianthi to Paul Reed Smith's attention which led to her endorsement. Orianthi relocated to Los Angeles, signed with Geffen Records in late 2006 and struck a management deal with 19 Entertainment. Orianthi has made a commercial for Panasonic, featured in the song "Now or Never" for Bratz: The Movie, played at the Eric Clapton Crossroads Guitar Festival, appeared in The New York Times business section promoting eco-friendly acoustic guitars, and opened for Steve Vai in the US. I don’t know exactly why he picked me, but he watched my YouTube videos and loved them. He had his choice of guitar players, but I came in and played the ‘Beat It’ solo for him. Afterward he was so happy he got up and grabbed my arm and started walking up and down the stage area with me. He said, ‘Can you play once for me?’ and hired me that night. I wish he was still around. He made me believe in myself more, and I learned so much. Going into it, I thought it would be all about playing guitar solos. But the majority of it was playing chords and funky rhythms. She played and sang at Jackson's memorial, globally televised live on 7 July 2009. She appears in the film Michael Jackson's This Is It, which chronicles the rehearsals for the tour and shows her and Jackson on stage. She presented an award at the 2009 American Music Awards, which Jackson won posthumously. Orianthi also appears on "We Are the World 25 for Haiti" – with the original co-written and partly performed by Jackson. She plays guitar on the song "Monster" by Michael Jackson featuring 50 Cent which was released on Michael on 14 December 2010. Orianthi started working on her major label debut Believe in 2007 which was released in October 2009. The album produced the worldwide hit "According to You", which was the Single of the Week on iTunes on 27 October 2009, reached number 2 on US radio airplay and charted to number eight in Australia, three in Japan, and achieved platinum status in the US and Australia. The charismatic rock instrumental "Highly Strung" featuring Steve Vai became a popular YouTube video with millions of views and climbing, and her song "Suffocated" was featured on Guitar Hero: Warriors of Rock as a playable song. Orianthi followed up with a four-song EP including two singles "Shut Up and Kiss Me" and "Courage". Orianthi appeared on several late night shows most notably on American Idol results show 26 March 2010. In 2010 she toured extensively with headlining shows in the US, Japan, Australia, and Malaysia. She also opened for other artists including: John Mayer, Mika, Kid Rock, Daughtry and over 30 dates for Adam Lambert’s Glam Nation Tour with former Idol contestant Allison Iraheta. Orianthi performed at various music festivals and charity functions most notably at the Stand Up to Cancer telethon. Orianthi has been very prolific in collaborating and being featured by many artists. She is featured on Iraheta's third single "Don't Waste the Pretty" and on Fefe Dobson's song "Can't Breathe" which appears on Fefe Dobson's album Joy released in November 2010. She has stated that the people she has collaborated with (i.e. Allison Iraheta and Lacey Mosley) are some of her best friends. She recorded for the song "Sadda Haq" composed by Academy award-winning composer A. R. Rahman for a Bollywood 2011 film soundtrack Rockstar. The song became very popular and garnered substantial media coverage in India for Orianthi, being cited for her time as Michael Jackson's lead guitarist. On 12 October 2011, the 5 track EP Fire, produced by Dave Stewart was released as an iTunes download. Her third studio album, Heaven in This Hell, was released on 12 March 2013. Orianthi joined supergroup Hollywood Vampires on the track "Whole Lotta Love" from the band's 2015 self-titled debut album. In October 2016, Orianthi featured in The 2016 NRL Grand Final pre-game entertainment alongside Richie Sambora. Their performance was met with mixed reviews, and Sambora defended their performance the following day on Twitter. 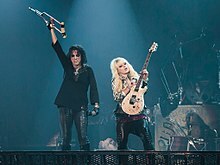 On 29 August 2011, Orianthi was announced as Alice Cooper's new guitarist. She replaced Damon Johnson, who is now a member of Thin Lizzy. She was the first female member of the Alice Cooper band. Orianthi did two world tours with Alice Cooper, but resigned in June 2014, and was replaced by Nita Strauss. Orianthi has appeared as a guitarist for other stars including shows with Michael Bolton, Dave Stewart and James Durbin. She also appeared on the Top 7 week season 12 of American Idol on 3 April 2013 to play guitar for each of the performances. One month later Orianthi performed Fine China with Chris Brown at the 2013 Billboard Music Awards, and on 8 December of that same year she paid tribute to Carlos Santana, performing in the Kennedy Center Honors Gala. She spent most of 2013-2015 touring with Dave Stewart, started BeMyBand, and released a song. In 2014, she joined Richie Sambora for his solo tour in Australia and Europe. In 2016, the two toured under the name RSO in Australia, South America and England. Orianthi met with Little Kids Rock students at the annual trade show for music merchants (NAMM) in 2010 after they opened for her. The kids gave her an acoustic guitar they autographed and she joined LKR's Honorary Board. She also has a special private stock PRS Custom 24 guitar, nicknamed "MJ", made for the "This Is It" concerts. This one of a kind guitar is decorated with Swarovski crystals. ^ 19 Entertainment. "Orianthi at 19 Entertainment". 19 Entertainment. Retrieved 15 February 2010. ^ "12 Greatest Female Electric Guitarists". Elle. 21 August 2009. Retrieved 22 October 2011. ^ a b "Guitar Awards 2010 : Guitar News". Guitarinternational.com. 10 October 2011. Archived from the original on 9 October 2011. Retrieved 14 October 2011. ^ a b c The Age Article: "Lady plays the blues: Santana among fans" Patrick Donovan 7 July 2007"
^ Crawford, Carly; Kyriacou, Kate (5 July 2009). "Adelaide musician Orianthi was Michael Jackson's guitarist". Sunday Mail. SA. Retrieved 17 October 2009. ^ a b c "Blog Archive – Michael Jackson and that blond guitarist". Anderson Cooper 360. CNN.com Blogs. Retrieved 25 December 2010. ^ a b c "Jackson rehearsal video guitarist discovered by LI's Vai". Newsday.com. 10 July 2009. Retrieved 25 December 2010. ^ "CarrieNEWS: Carrie Underwood's Grammys guitarist: Who was that?". Newsfeed.carrienews.com. 8 February 2009. Archived from the original on 12 May 2011. Retrieved 25 December 2010. ^ "News : Rating the Grammys: Alison Krauss and Robert Plant Rule". CMT. 9 February 2009. Retrieved 25 December 2010. ^ "Who's Michael Jackson's guitarist? Meet Orianthi Panagaris". MusicRadar.com. 3 July 2009. Retrieved 25 December 2010. ^ "Orianthi gets We Are The World call-up". Herald Sun. 2 February 2010. Retrieved 25 December 2010. ^ "Allison Iraheta "Don't Waste the Pretty" feat. Orianthi – New Song"". aolradioblog.com. 4 June 2010. Retrieved 6 June 2010. ^ "BestFan.com". Retrieved 25 December 2010. ^ "MJ's lead guitarist plays for Ranbir!". The Times of India. 30 September 2011. Retrieved 14 October 2011. ^ "MJ's female guitarist strums for Rockstar". Hindustan Times. 30 September 2011. Retrieved 14 October 2011. ^ "Orianthi Announces Release Date for New Solo CD, 'Heaven in This Hell'". Guitar World. 28 January 2013. Retrieved 2 February 2013. ^ "Richie Sambora responds after NRL grand final performance slammed". www.9news.com.au. ^ Derrough, Leslie Michele (2 October 2017). "MY ROOTS: Guitarists Orianthi & Richie Sambora Celebrate New Musical Adventure With RSO". Glide Magazine. Retrieved 2 October 2017. ^ "Soundstage - PBS Programs - PBS". Soundstage - PBS Programs - PBS. ^ "Orianthi Joins Alice Cooper's Band". Gibson.com. Retrieved 14 October 2011. ^ "10 Awesome 2013 Billboard Music Awards Performances: Watch". Billboard. 23 May 2013. Retrieved 2 August 2014. ^ "The Kennedy Center Honors". Kennedy-center.org. Retrieved 2 August 2014. ^ "Interview: Orianthi and Dave Stewart Discuss BeMyBand, Where Winners Share the Stage for the Gig of a Lifetime". 17 January 2014. ^ "RSO feat. Richie Sambora & Orianthi Concert Setlists". setlist.fm. Retrieved 2 October 2017. ^ "Orianthi". Little Kids Rock. Retrieved 2 August 2014. ^ "Elle". Retrieved 5 January 2011. ^ Knox, David (16 August 2010).Kids’ Choice Awards: 2010 Nominees. tvtonight.com.au. Retrieved 16 August 2010. ^ "25th Japan Gold Disc Award 2010". Tokyo Hive. Retrieved 28 February 2011. ^ "Tokio Hot 100 Awards 2010". Tokyo Hive. Retrieved 28 February 2011. ^ "2011 BMI Pop Music Awards Award-Winning Songs". BMI. Retrieved 20 May 2011. ^ "Gibson Guitars". Retrieved 1 June 2011. ^ "WiMN". Retrieved 1 March 2013. ^ www.prsguitars.com Quote: "Orianthi posed for the cover of “Believe” holding a whale blue Custom 24 completely covered in Swarovski crystals. The guitar was custom made for the Michael Jackson tour and was nicknamed “MJ” by Orianthi. 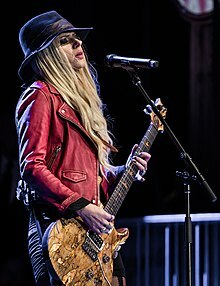 Wikimedia Commons has media related to Orianthi.